Tonight, Sami Zayn faces Samoa Joe for the number one contender spot. Good match. It really seemed like a match between Dash & Dawson and American Alpha until the very end, but everyone contributed to make this a fun match. Alex Reyes asks Deonna Purrazzo about her preparations for facing Asuka. She says being knocked out was a learning experience. Dana Brooke tells her that she hasn’t learned a thing about respect. Emma asks if she’s been living under a rock. Kind of a squash, but it was a fun match. Asuka destroyed Deonna. Her attack was relentless. Eva Marie talks about making a statement. Nia Jax said she should be number one contender. Pretty good match. Dillinger looked good, better than usual, and I liked the dynamic between him and Riley. Riley is taking himself way too seriously, and this is actually an interesting development in his character. Alex Reyes asks for Balor’s prediction for tonight’s main event. Balor first complements Crews. He then says he can’t pick a winner for tonight’s number one contender match. Regardless, he will defend his title against either of them. 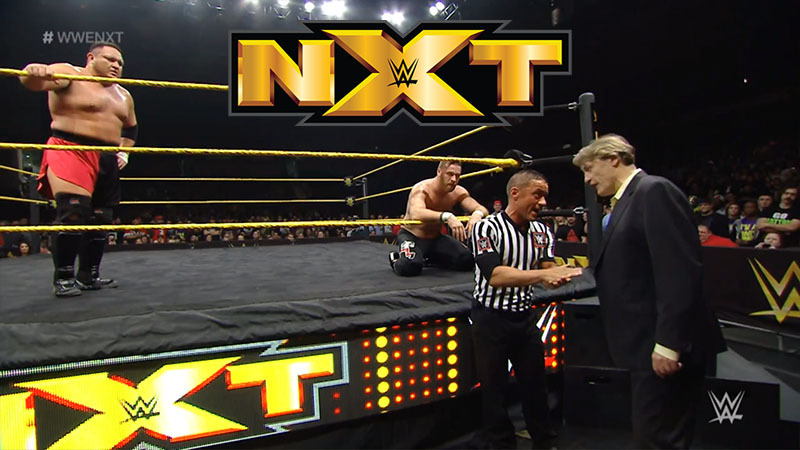 Baron Corbin tells Regal that he deserves to be in the number one contender rematch. Regal tells him that he lost and that his decision is final. Corbin says he believes in an eye for an eye and walks away. A good match with a storyline finish. I think they’ll have even better matches against each other, but there were some nice moments here. It had a nice build and was a good match between two very different athletes. The finish makes sense and I like the fact that the referee in this one was very sure of his decision, unlike the ref in the triple threat match. Not a bad show. Looking back at all the matches I actually like them more than I thought I might. Yeah, Asuka had a squash match and Alex Riley wrestled, but both of those matches were at least interesting or fun to watch. And the tag match and main event were both good. Regardless of the finish, this was still the best match of the night. Plus, I really like Regal’s frustration face. Classic.